Lawrence Scaff offered a fascinating preview of his forthcoming book, Max Weber in America , at a sociology seminar in Ann Arbor this week. Scaff has written extensively on Weber in the past, and this current research is particularly intriguing and stimulating. The book offers a careful reconstruction of Weber’s visit to the United States in 1904, and it then goes on to provide a brilliant interpretation of the “discovery” of Weber in the United States in the 1940s and forward. Let’s start with the obvious: it is startling for those of us who are not Weber experts to learn that Weber spent time in the United States at all. It’s weirdly dissonant for me to imagine this quintessentially German sociologist, wandering the streets of Chicago and the plains of Oklahoma. What did he make of Chicago 1904? How did it influence his development as a sociological thinker? Scaff also writes quite a bit about the intellectual connections between Weber and William James during this period. He explores important parallels between The Varieties of Religious Experience: A Study in Human Nature and The Protestant Ethic and the Spirit of Capitalism. This is significant, because the first part of The Protestant Ethic was written and presented for publication just before the trip to America, whereas the second part was written after the visit. But even more important is the effort that Scaff makes to get inside the developing sociological imagination of the thinker. This is what is most intriguing about the book, and what makes me most eager to read it when it appears in early winter. Scaff makes a point that I find really intriguing about the way in which “Weber” was constructed as the founding sociologist we now summarize in courses on sociological theory. This falls generally into the topic of the sociology of knowledge: how did concrete historical and institutional processes influence the construction of “sociology” or “physics”? Scaff argues that much of our current representation of Weber derives, not from Weber directly, but from the ways in which Weber was appropriated and “re-broadcast” by American sociologists in the 1940s and 1950s, including especially Talcott Parsons. 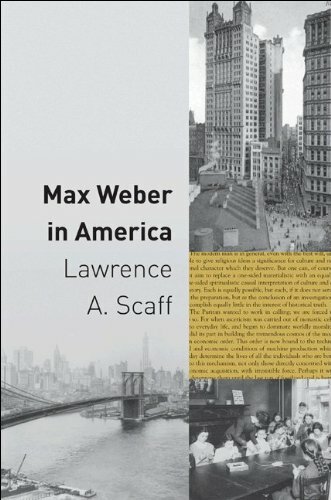 (Ironically, Scaff argues that the “Weber” who became important in German sociology in the 1960s was this American version, not a systematic re-reading and re-thinking of Weber’s corpus. Weber was more or less forgotten in German intellectual circles during the Nazi period.) So this standardized version of Weber’s sociology reduces the rich sociological thought of the thinker over a long career to a few standard theses. One of Scaff’s goals, then, is to “blow up” the sociology expressed across Weber’s writings and try to see how the parts might be fitted together in other ways. Can the canonical Weber be interpreted in significantly different and more nuanced ways? This is a particularly interesting and fertile question, and it contributes directly to the important project of trying to rethink the making of modern sociological imagination and frameworks. This is all really important material for those of us who are interested in the contingent development of modern sociology. So Scaff’s book is one that I’m eagerly anticipating when it appears in January. Here is the table of contents for the book. A “Spiritualist” Construction of the Modern Economy? The St. Louis Congress: Unity of the Sciences? A Way Out of the Iron Cage?